Gucci is a name synonymous with luxurious fashion with a twist. The fashion house is now one of the best-known brands in the world; an aspirational name that has captured the imaginations of countless individuals with a flair for fashion. From the green and red stripes to the snaffle-bit loafers, Gucci has made a huge impact on the world of fashion over the course of its nearly 100 years of history. The brand is still a mark of luxury, and under the guidance of current creative director, Alessandro Michele, Gucci remains one of the most popular, creative and daring fashion brands in the world. 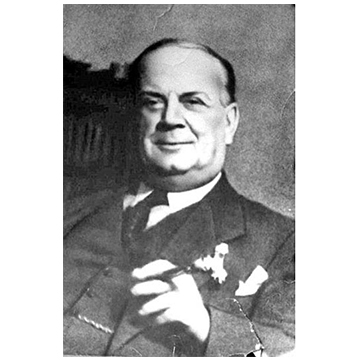 Born in 1881 in Florence, Italy, Guccio Gucci spent time in Paris and London working as a hotel worker. It is here that he began drawing inspiration from the things he saw around him, such as the luxurious luggage used by upper-class hotel guests. Gucci later returned to his birthplace, Florence, where he opened his first shop in 1921, trading in fine leather goods. The Gucci name was known for superior craftsmanship as Guccio chose to employ skilled workers who were attentive to finishing. As the company grew, Gucci’s love of horses served as further inspiration as he drew from equestrian iconography for his designs. Opening stores in Milan and Rome, Gucci continued to trade in leather goods, such as handbags and shoes as well as silks and knitwear. The founder’s death in 1953 did not slow down the growth of the fashion house as his sons took over the reins, further expanding across the world and creating more adventurous and fashion-forward designs, including stylish and innovative timepieces. Gucci’s current creative director, Alessandro Michele has placed a large focus on the ‘Gucci Garden’ with animals featuring heavily across their designs. The Gucci bee is a particularly popular design, partly due to its association with the city of Manchester. The Gucci G-Timeless Bee Watch pairs two iconic Gucci elements – the bee and the green and red stripes, ensuring that this piece is instantly recognisable. 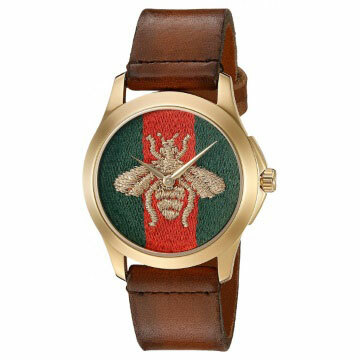 This timepiece is a unisex design and features a PVD gold plated case and brown leather strap with a green and red web nylon dial and a gold embroidered bee. It is powered by an analogue quartz movement and is currently available for £620 or for as little as £10.33 per month on 0% finance. This gentlemen’s watch offers a traditional style with a contemporary appeal. 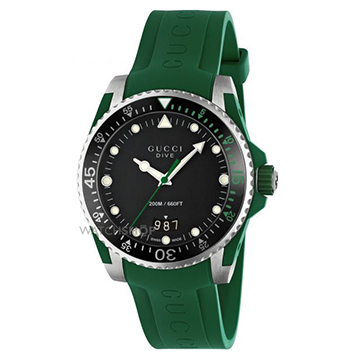 The diver’s watch design meets the iconic style of Gucci, using the familiar shade of green that is synonymous with Gucci. The watch features a steel and black PVD case with a black dial. The strap is green rubber, adorned with the Gucci name. The second hand and part of the bezel use the same green, completing the design. In addition, the Gucci Dive Gents Watch is water resistant up to 200m. If you buy now, this timepiece can be obtained for £730 or for as little as £12.17 per month on 0% finance with a deposit of £146. The G-Timeless collection has contributed some of Gucci’s most exciting watch designs, such as the Gucci G-Timeless Moonphase Collection Watch. This timepiece pulls together some of the most recognisable Gucci motifs and displays them in one playful, yet stylish piece. 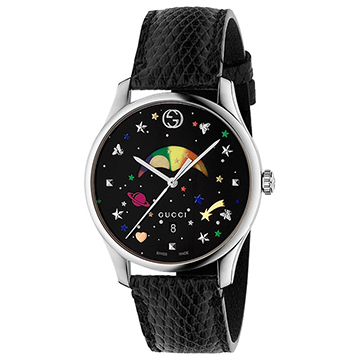 The black dial displays fun celestial symbols, with the Gucci bee and stars replacing traditional numerals. The recognisable interlocking ‘G’ logo sits at 12 o’clock, just above the multi-coloured moonphase window which shows the phases of the moon. Before 1st April 2018, this unique piece can be purchased for £1,070 or for as little as £17.83 per month with a £214 deposit on 0% finance. Read more about this watch in a previous blog, ‘Fun and Fashion: Gucci G-Timeless Moonphase’. Gucci watches capture the essence of the brand, with creative, progressive and influential designs that are perfect for fashion-forward individuals hoping to make a statement through the pieces they choose. If you would like to arrange a viewing, you can contact a member of our team by calling 01524 38 10 20 or by filling out the ‘arrange a viewing’ form on your selected product page.